and move us to vote ‘biblically’ in this upcoming election. Does A Candidate’s Faith Matter? Does a persons faith or religious association matter? Should their faith be a secondary consideration when examining them as a candidate? Should their faith be kept out of the decision altogether? What do politics and religion have to do with each other? Are they related at all? Should we separate the two when voting? If so, how? . How Should We Pick a Candidate? What about voting for the lesser of two evils? Should the political party matter? Should we vote for a biblical candidate that we know will never win? What is the standard for picking a candidate? Are All Issues Equally Important? Are all issues equally important or should lesser issues not be considered when voting? What are the most pressing issues of the day, and if a candidate does not agree with me on these issues, should I eliminate them from consideration? 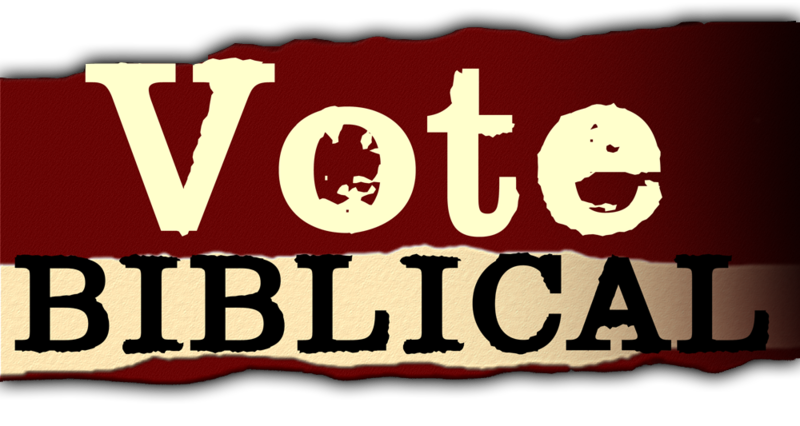 In order to save our country and salvage freedom for yourself, your family and for our nation, it is not voting biblically that is most important, but to do exactly what is revealed in this segment is what matters. This is the full length version of ‘How to Vote Biblical’. It contains all of the lessons on this page in one continuous video. Download the following free resources for distribution in your church, ministry organization or to give to family and friends. Just ‘right click’ on any click and select ‘Save Target As’ to save to your computer. We transcribed the all of the ‘How to Vote Biblical’ videos and put them into one, printable document. Feel free to share, download, print or distribute as you like. Click here to download. This 2016 Christian voter guide analyzes the 2016 presidential candidates and issues from the Christian perspective. This voter guide is for Christian voters, as well as non-Christian voters who are interested in the Christian perspective on the 2016 presidential race. Download the full audio version of all of the ‘How to Vote Biblical’ lessons in mp3 format. All of the lessons are on one 13 minute file. Download here. Pat Necerato is filmmaker, speaker, teacher and founder of Go Stand Speak Ministries. Go Stand Speak is committed to restoring the Christian values and biblical standards our country was built upon and provides various resources in these areas. This website and its content is copyright of Pat Necerato, © Go Stand Speak Ministries 2016. All rights reserved.